ABC Inoac Managing Director Shane Kavanaugh, center in suit, with employees at the company's opening ceremony for its new plant in San Juan Del Río, Mexico. SAN JUAN DEL RIO, Mexico — Canadian-Japanese joint venture auto industry supplier ABC Inoac Exterior Systems Inc. has opened its first greenfield facility — a $45 million injection molding plant — in central Mexico. The company, which is a 50-50 venture between ABC Group Inc. of Toronto and Inoac Corp., of Nagoya, Japan, will make exterior trim parts, including spoilers, for General Motors Co., Nissan Motor Co. Ltd., Ford Motor Co. and Honda Motor Co. Ltd. at the plant in San Juan del Río. The manufacturing area, equipped primarily with Engel presses, covers 188,000 square feet, with another 20,000 square feet for offices. The plant, ABC Inoac de México SA de CV, 105 miles northwest of Mexico City, becomes the fourth facility operated by ABC Inoac, which formed in 2012. The others — in Toronto, Fremont, Ohio, and Livingston, Tenn. — were existing plants, owned either by ABC or Inoac. ABC Inoac CEO Angelo Cesta said at a July 12 plant opening ceremony that it will have 300 employees by the time it reaches full production, likely in three years. Inoac, meanwhile, plans to build its own automotive interiors and foam plant in San Juan del Río. Chuck Little, president and CEO of Inoac USA, said Inoac has purchased 17.2 acres adjacent to the new joint venture plant and “will probably start construction” of its own facility in 2017. 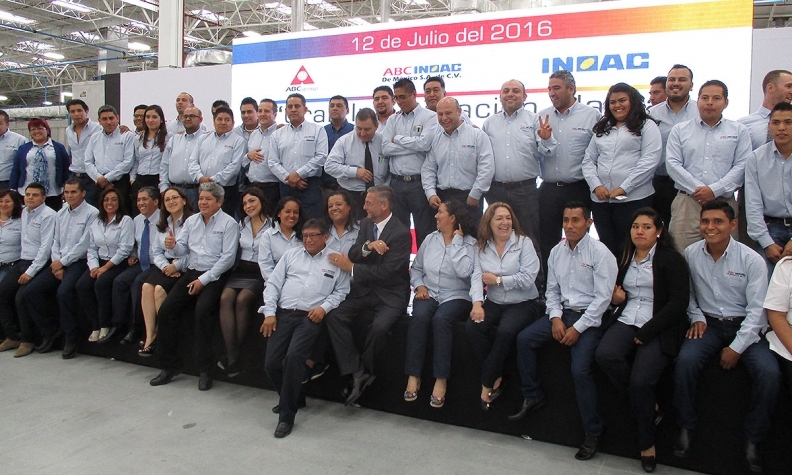 Inoac already operates five manufacturing facilities in Mexico, most of them in Monterrey. 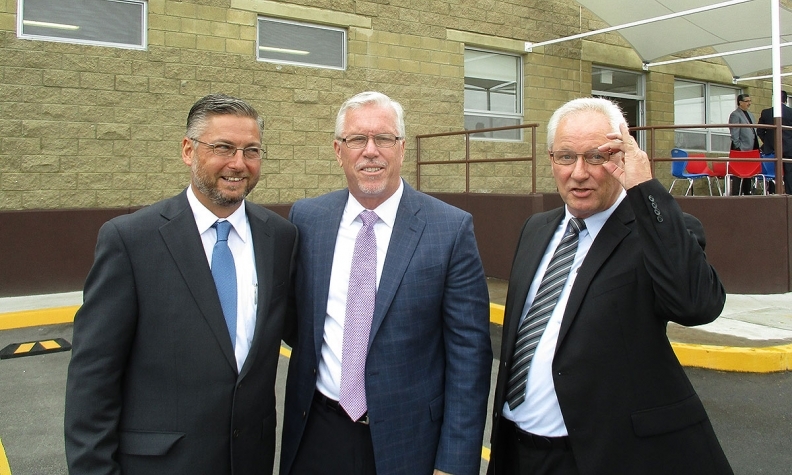 From left: Shane Kavanagh, managing director ABC Inoac de México,;Mark Poynton, chief operating officer ABC Group; Glenn Penney, controller for ABC Inoac. ABC has three manufacturing plants in San Juan del Río and one in nearby Querétaro, according to Mary Anne Bueschkens, ABC Group’s CEO, who also spoke at the inauguration. She said the companies are building in Mexico because of the investment there by automakers. “Since 2009 there have been no additional OEM assembly plants built in the U.S. or Canada, but 10 have been built in Mexico over the same time period, with three more slated over the next few years,” she said. Cesta said the joint venture has spent $20 million on machinery for the San Juan del Río plant. The facility’s injection molding machines will have clamping forces ranging from 900 to 2,500 tons. Everything manufactured at the plant will be transported to OEM facilities in Mexico, said Cesta, who declined to discuss ABC Inoac sales and production figures. ABC ranks No. 69 on the Automotive News list of the 100 largest North American suppliers to the auto industry, with estimated direct sales to automakers of $895 million in 2015. For more in-depth coverage from Plastics News, an affiliate of Automotive News Canada, click here.